Line bottom only of 8-inch cake pan with parchment paper cut to fit. Or, alternatively, have 10-inch tube pan ready. In medium bowl, combine flour, cocoa powder, 1/3 cup sugar, baking powder, and salt; mix well. Pour in oil, water, vanilla, and egg yolks. Beat for 1 minute or until very smooth. Wash beaters. In large bowl, and with clean beaters, beat egg whites and cream of tartar until soft peaks form. Add remaining sugar and beat until stiff peaks form. Pour egg yolk mixture evenly over stiffly beaten egg whites. Fold in until blended and evenly colored. Pour into prepared pan. With knife, cut through batter to remove air bubbles. Smooth top. Bake in 350°F oven for 40 minutes or until tester inserted in center comes out clean. Cool on wire rack. (Or, if tube pan is used, invert pan and allow to hang upside down on its own rack or funnel.) 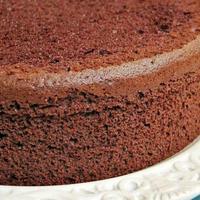 Loosen around edge of cake; invert onto cake plate. Remove parchment paper. This is nice. I will used this recipe to make one. I haven't made a chiffon cake in years. This one looks and sounds delicious ..